Operating seven hydroelectric dams and four fish hatcheries. Purchasing electricity from the Bonneville Power Administration. Maintaining and upgrading nearly 2,400 miles of power lines. Keeping the electrical system secure from cyber and physical threats. Investing in technology to comply with federal regulations, improve reliability and enhance customer service. Improving programs to keep employees and customers safe. 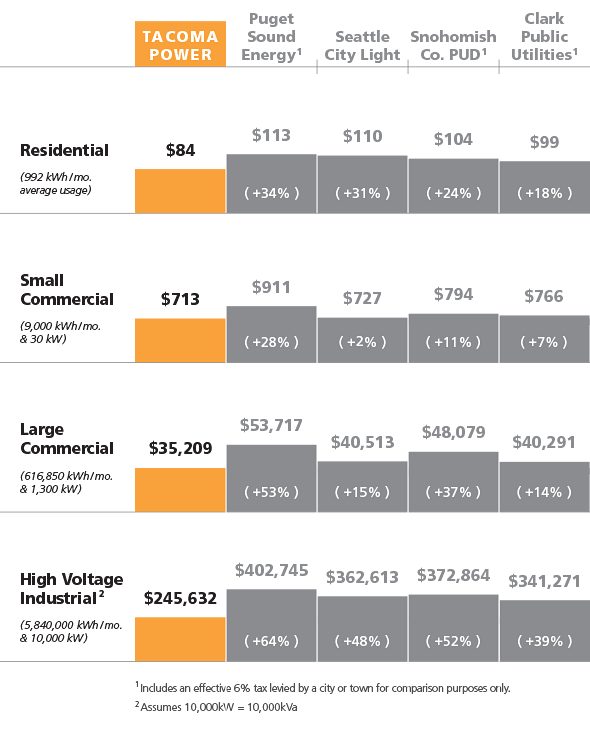 Compare our current rates with those of other major utilities in our region. What Goes into Electric Rates? The energy use reflects the costs associated with buying or generating electricity. The delivery rate reflects the cost of equipment (poles, lines, transformers, etc.) associated with delivering electricity from its source to your home or business. The customer charge includes costs for meter reading and billing. You can track how much electricity you use at home at home by reading your meter. If you have a dial meter, from left to right, read the smaller of the two numbers on either side of the pointer. The sample shown here has a reading of 8542. If your meter has four dials, multiply the meter reading by 10. That number is the amount of kilowatt hours you’ve used. To determine how much electricity you’ve used, subtract your previous meter reading from the present one. For more information about your utility bill, call (253) 502-8600.